When we think of villa-style living we often envision an expansive house in a rolling, rural locale. 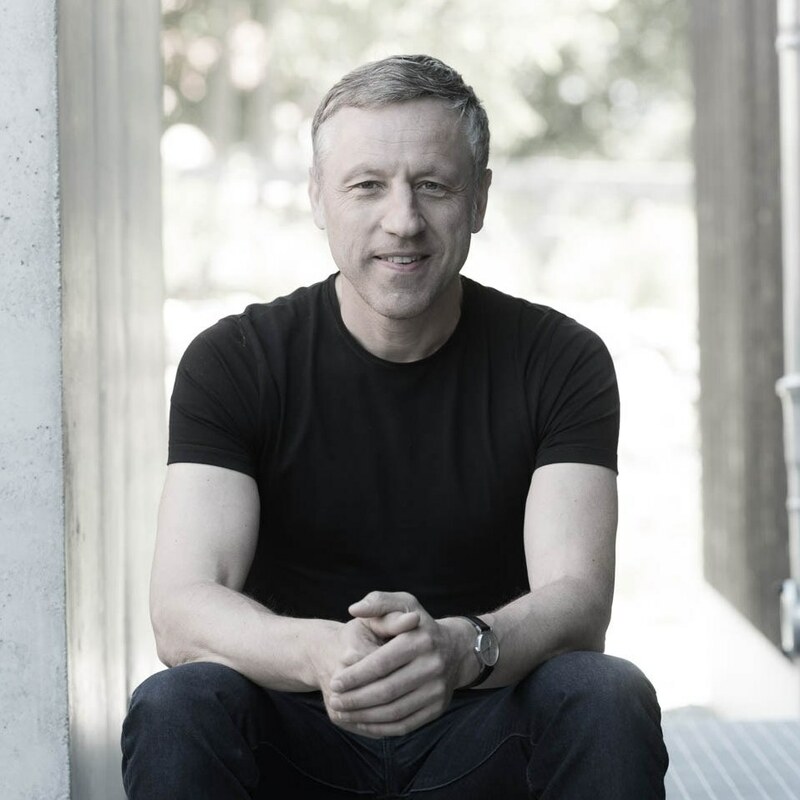 The designers at Berlin's Mohring Architekten have turned this idea on its head in the home we're about to witness, taking the top floor of a Berlin apartment and creating a penthouse villa which is elegant and relaxed in understated, modern style. From the outset the villa appears spacious and open for an apartment of only 85m², with its white walls, open plan and plentiful shelving creating a lovely home in one of Europe's coolest and most vibrant cities. Upon entry we are greeted by an expansive living area, with shelves bordering the room to house a raft of books and decorative objects. Large windows are featured throughout, inviting sun and air to refresh the space and creating a lofty and uplifting atmosphere. The bathroom within the home is both warm and contemporary, with its pale brown tiles, clean lines and sleek surfaces exuding the essence of modern luxury, and an office space has been included, which delights with a lovely view of the city through its generous stretch of windows. Take a tour below of this lovely villa in beautiful Berlin and let us know what you think! 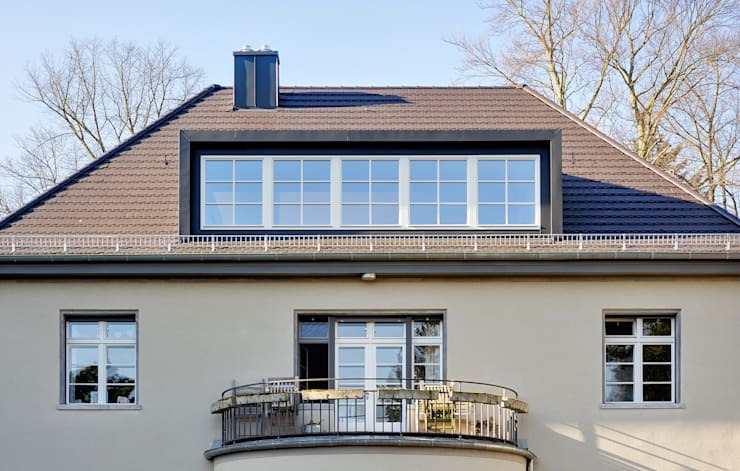 The exterior of the home is perched atop a classic, post-war Berlin apartment building. The roof has been added relatively recently, a fact which explains the villa's streamlined, contemporary facade. Expansive windows provide lovely views of the surrounding neighbourhood, with the simple, concrete walls of the building and the classic style of its windows barely giving a hint of the cool, modern luxury to be found within. The rustic wooden beams and roof tiles of the attic seen here lend insight into what this lovely home used to look like before undergoing its impressive, modern revamp. 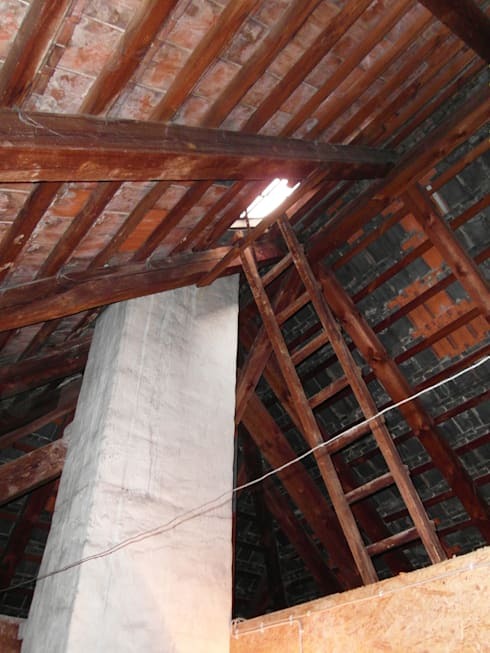 Lofty and industrial in style, the former roof space exudes history, with a strong, concrete chimney drawing focus as it surges upwards, and a small skylight included, allowing sunshine to filter down below. 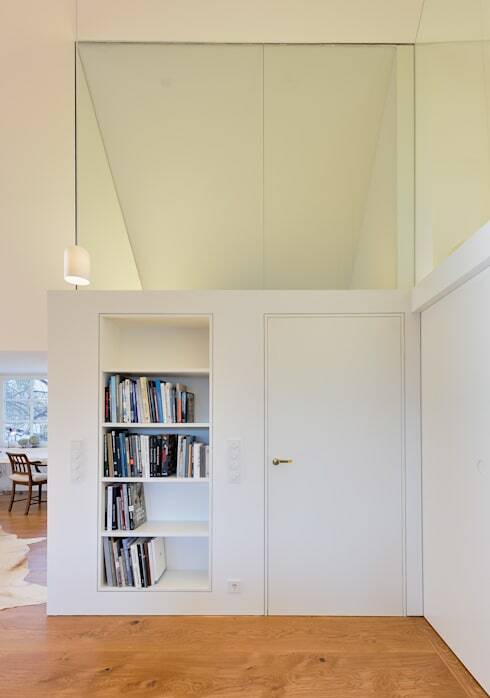 The entrance to the home immediately introduces a modern and stylish renovation, with white walls capped in large, glass panels stretching upwards to meet the sloping ceiling. A simple bookshelf by the front door brims with activity, with a busy array of titles lining the shelves, waiting for new additions. The lovely caramel hue of polished wood melts across the floor, and the space is well lit by hanging lamps of contemporary design and the large stretch of windows in the living space beyond. 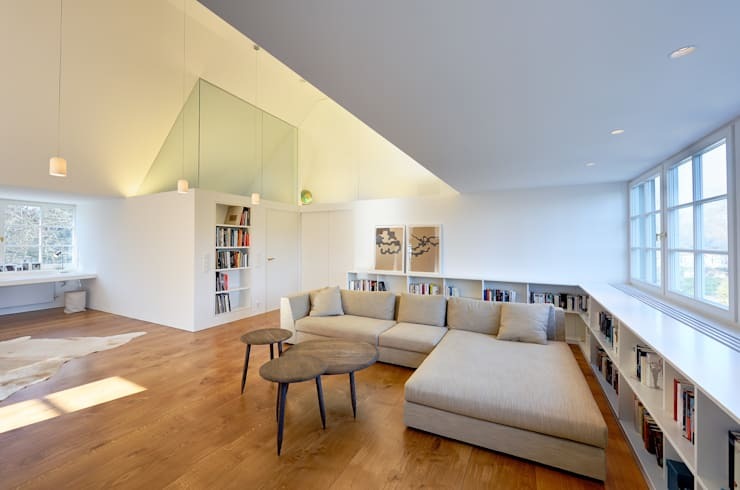 The living area is spacious and open, with its white walls and ceiling helping to create a light and lifted atmosphere in which natural light can bounce and glow. The space is bordered by extensive shelving units, providing ample room to display books and other objects of interest. Furnishings have been kept simple and contemporary, with a large lounge suite in a muted tone providing a vantage from which to laze and admire the apartment's lovely view, and the selection of wooden tables nearby able to be easily moved about the space for added functionality. 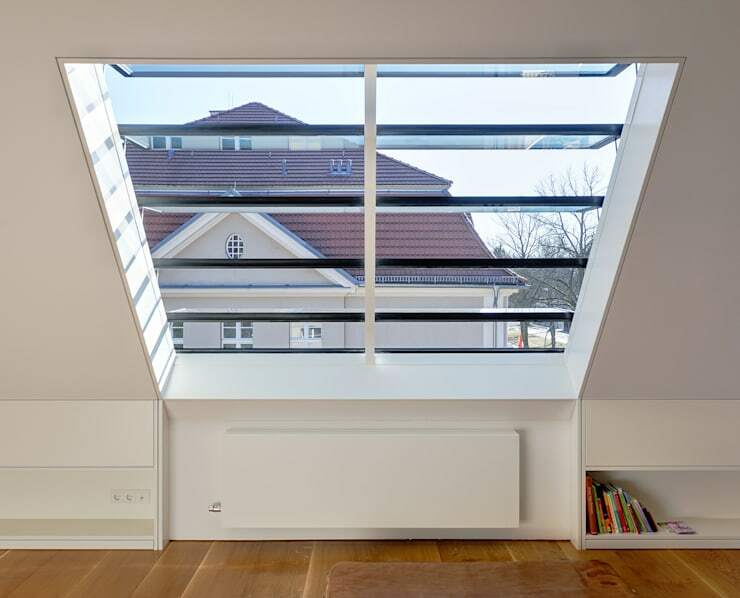 The sloping walls and ceiling of the home house an array of large windows, providing a gorgeous view of the classic, Berlin neighbourhood beyond. These expansive portals also serve to invite air and illumination into the home, adding to its light and lofty atmosphere and easing the constraints of apartment living. A low-lying space for shelving has also been included here, with storage throughout the abode designed to spice up the decor through the placement of colourful, personal artefacts. The bathroom is trimmed with textured, brown tiles presenting a contrast to the dazzling white of the remainder of the apartment. 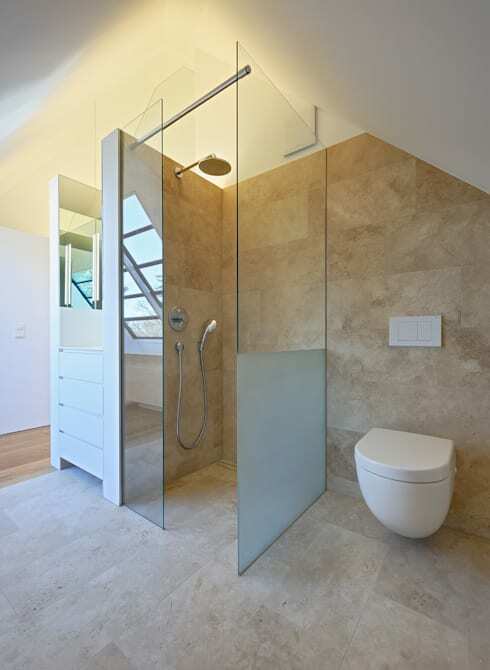 The shower unit is large and modern, with the entire room evoking a contemporary feel through the use of clean lines, sleek surfaces and details such as the floating toilet and rain shower. The room has been constructed without a fourth wall, creating a sense of openness within its small plan. A simple storage unit and large mirror have been included for stylish functionality. The home also includes this simply designed office space, which rests elegantly in the glow of sunlight streaming through its large windows. 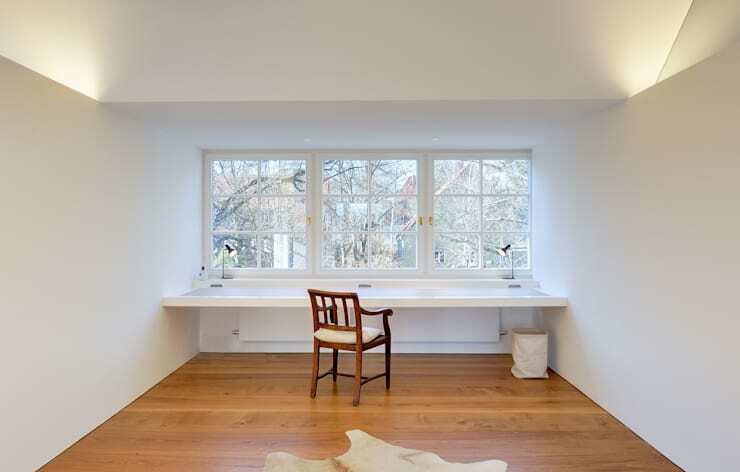 The white walls and ceiling are warmed by the darker tones of the desk chair and floorboards, while a built-in desk provides office-style functionality. Central to the space are the beautiful, classic windows, which provide bursts of colours from the surrounding scenery and evoke the history of the apartment building and the magical city beyond its walls. Inspired by the functional style of this home's living room? Have a look at 7 steps to an individual living room for more ideas! Would you like to live in this lovely, Berlin villa? Tell us why below!